After multiple attempts to summit K2 in winter, a Polish team is finalizing their plans to attempt the last 8000er not summited in winter. They will arrive in Pakistan after Christmas this year, 2017. K2 is the world’s 2th highest mountain at 28,251’/8611m. It is located in northwest Pakistan about 30 miles from the border with India. K2 is called the Mountaineer Mountain and the Savage Mountain for its deadly and difficult reputation. The expedition has been in the planning stages for years but perhaps one of the biggest last minute changes is that elite Kazakstan alpinist Denis Urubko will join the team. He has held Polish citizenship since February 2015. See this recent interview with Urubko in Alpinsimonline. This report from PPA revealed a tremendous amount of gear being transported to base camp: 600 kg (1322 lbs) of cargo in addition to 400 kg (881 lbs) they will travel with as they move to base camp. This includes thousands of meters of rope, anchors, pitons, snow bars, tents, food, stove, fuel and a lot more that’s part of modern expeditions. The team is composed of Adam Bielecki, Marek Chmielarski, Rafał Fronia, Janusz Gołąb, Marcin Kaczkan, Artur Małek, Piotr Tomala, Jarosław Botor and Dariusz Załuski in addiiton to Urubko and Wielicki. It is planned that they will take the Česen aka Basque Route but may evaluate the Abruzzi as well. The most significant obstacle the Poles will encounter is the weather. Even in the summer it is unpredictable, harsh and deadly. High winds have blown climbers off the summit, avalanches have killed climbers in their tents at high camps and some have simply disappeared. But the weather is the wild card. They will need winds under 60 kph/40mph for a safe ascent. It appears the team will do the standard siege style climb establishing four camps as they set the route with a fixed rope and stock camps with food and fuel. They will not be using supplemental oxygen while climbing. 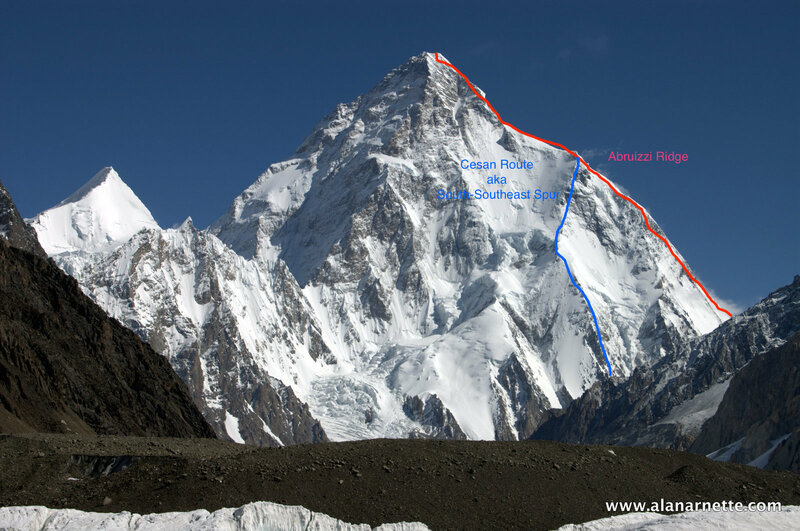 While there are multiple routes on K2 including from the Chinese side, most of the summits have been successful via the Abruzzi Spur. On this route, there are multiple camps depending on conditions. The Česen and Abruzzi routes merge at Camp 3. From my own summit of K2 in 2014, this is my brief description of the route. The climbing starts steep from start to finish as in 40 degree minimum snow slope angles and near vertical rock or ice walls. From ABC to C1 it is a long snow slope with some rock. The rock climbing starts upon leaving C1 to C2 and includes House’s Chimney – a 100′ near vertical rock crack at 21,500′ – just below C2. The Black Pyramid consumes the entire route from C2 to C3 and is the technical crux in my opinion with sustained rock climbing ranging from high class 4 to mid 5’s. From C3 to C4 it is a short (3 hour) snow climb but the angle is still very steep – 50 degrees – you don’t want to fall. From C4 you can see the Ice Serac plus the summit. Leaving C4, it starts off on another steep snow slope, maybe 40 degrees then hits the Bottleneck. We avoided the Bottleneck in 2014 since it was filled with rock and huge ice blocks and took a right hand variation onto a large buttress still well underneath the Ice Serac. This was safer with respect to the gulley aka Bottleneck but put us under the Serac longer. The Traverse past the Bottleneck was unrelenting but only about 500 meters in total distance. There was one exposed section that required using your crampon front points on a 2 inch ice stub to support your weight while maintaining balance using the fixed rope at your chest. But most of the traverse allowed for full purchase with crampons. From here it was another 2 hours to climb more steep snow slopes at 50-60 degree angles to the summit. Alan with Kami Sherpa on K2 Summit. The first attempts began in 1902 by Brit Aleister Crowley. But it was the Duke of Abruzzi whom made the most valiant attempts in the early 1900’s thus named the ridge most popular used today, the Abruzzi Spur. The first summit of K2 was on July 31, 1954 by Italians Lino Lacedelli and Achille Compagnoni. According to 8000ers.com plus my own research K2 has seen a total of 396 summits compared with over 8,000 on Everest. K2 can go for years without a summit. For example after 2012, there have only been summits in 2014 and 2017. 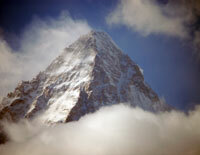 The best year ever for K2 was in 2004 with 51 total summits. 84 climbers have died on K2, 34 while descending from the summit making it was the second most deadly mountain in the world after Annapurna. 11 died in 2008 including my friend Gerard McDonnell. K2 has a special reputation for women climbers. Prior to 2014, of the nine women who have summited, five have died – 3 descending from K2’s summit and 2 on other 8,000m peaks. Basque climber Edurne Pasaban was the sixth woman to climb K2 in 2004 and, until 2014, was the only one of four still alive today along with Norwegian climber Cecilie Skog in 2008, Nives Meroi from Italy and Austrian climber Gerlinde Kaltenbrunner who summited from the north side of K2 in 2010. In recent years, K2 has been kinder to female climbers with 6 summits in 2014, including the Nepali womens team (Oasang Lhamu Sherpa, Maya Sherpa and Dawa Yangzum Sherpa); Chris Burke (New Zealand), Luo Jing (China), Tamara Lunger (Italy) and Vanessa O’Brien (US/UK) in 2017. An international team of 13 Poles, 7 Canadians and 4 Brits made the first attempt on K2 via Abruzzi Ridge. As usual the low camps were set up but progress stalled at the higher altitudes. It wasn’t until March 2 that Camp 3 was established at 7300 meters. Then high winds began to take its toll and members experienced frostbite and soon the entire effort was cancelled. To amplify the weather concerns, this expedition only had 10 days of ‘good’ weather in the three months they spent at Base Camp. The winter of 2002/3, Polish alpinist legend Krzysztof Wielicki lead a small team of four ember from Kazakhstan, Uzbekistan, and Georgia. They arrived in mid December planning to climb via the North Ridge. The lower camps were established in short order and by January 20 they had reached 6750m. But discourse within the team caused the Easter European members to leave except for Kazakh climber Denis Urubko. They went on to reach Camp 4 at 7650m in mid February and planned a summit attempt on February 21st but one member was hit with cerebral edema and the attempt, and soon, the entire expedition, was called off. The most recent winter attempt was by a large and strong Russian team on the Abruzzi Ridge route in winter 2011-12. The team consisted of nine climbers. They began at the end of December and quickly established Camps 1 and 2 at 6050m and 6350m respectively. By January 25, they had reached 7000m. High winds hit the mountain in early February and one member, Vitaly Gorelik, suffered from frostbite and pneumonia. The poor weather prevented an evacuation and Vitaly died in BC on February 6th. At that point the entire expedition was cancelled. In 2014/15 Denis Urubko planned an expedition from the North side but politics with China stopped the permit process. It will be fascinating to watch this year’s effort. K2 has demonstrated very strange weather the last few years with warmer than expected conditions and unusual snow. It remains to be seen what the Poles will experience over the next few months. But one thing we know for sure, if it can be done, this team has an excellent chance. They arrive in Pakistan just after Christmas, December 25, 2017, so I don’t expect them to begin establishing the route until January 10 or later. So excited to follow this! thank you Alan – can’t wait to read all the updates. Hello, is there an update available on who this climb is going? Hello, is there an update available on *how this climb is going? They arrive in Pakistan just after Christmas so I don’t expect them to begin establishing the route until January 10 or later. A croatian photographer is currently attempting south pole; unfortunately, his site is in croatian only.